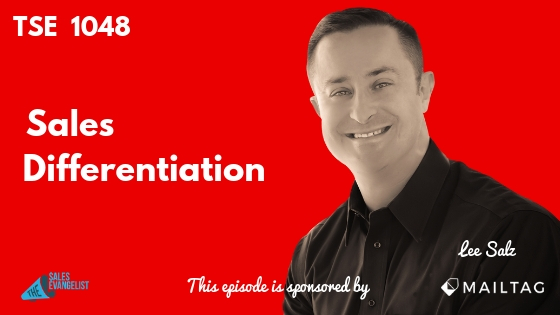 Sales differentiation helps salespeople win more deals at the price point they want, and today Lee Salz talks about building a framework that will allow you to personalize your sales. Sales reps in every industry must differentiate themselves in today’s market. It’s crucial for sellers to have room to “color” the sales process. When Lee was a kid, he had a job as a pickup and delivery driver for dry cleaning. The guy he worked for didn’t own a dry cleaning business; he simply knew it was a hassle to drop off and pick up your clothes. He developed a contract with a couple of different dry cleaning firms and he charged a premium for the service. The idea took off, and Lee was intrigued by the idea that he was able to add a 40 percentage point premium by differentiating the service. He didn’t actually put the idea into play until his 50th birthday after he had learned a lot about the industry. Lee said the philosophy translates for every possible seller. No matter what industry you’re in, what size company you’re in, whether you sell products or service, whether you sell B2B or B2C, and it doesn’t even matter what methodology you use in your sales. The premise is simple: win more deals at the prices you want. Differentiation around what you sell relies on the ability to translate your passion to the person sitting on the other side of the desk. If you can’t communicate your own passion about your differentiators to the person on the other side of the desk, you might as well not have anyone sitting there. The idea is to build passion and help salespeople communicate it in a meaningful way. You want your customers to believe they must have what you’re selling. 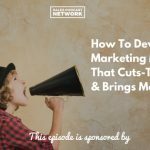 It’s a responsibility that falls to marketing, business owners, and sales leaders. It demonstrates all the available potential. Sales differentiation is two-directional communication with an individual, specific buyer. It takes all of the potential and personalizes it to an individual specific buyer. Everyone buys for a different reason so if you leave all the capabilities out there and rely on that to drive buyers, you’ll fail. You must have salespeople who gather all the potential and bring it to the individual level. Add those two things together and that meets the definition of solution. It doesn’t matter what you’re selling. Make a list of your most common competitors who also sell what you sell. Work with your team to do the analysis. Make a list of the decision influencers, the people commonly involved in the decision to buy what you sell. What is keeping them up at night relative to your offering? Given what is keeping them awake, how can you help? If you engage your team in these two workshops, you’ll get a series of differentiators that will serve as raw material to work with. From there, develop a communication strategy that helps you build passion around those differentiators. Every interaction between a seller and a buyer provides an opportunity to offer meaningful value that your competition doesn’t provide. Consider this: Would you prefer a restaurant with outstanding food and mediocre service or mediocre food and outstanding service? Most people will choose the outstanding service. That means you could have the best product features and functions but your failure to differentiate how you sell could cause you to lose. From that very first phone call to the time they sign on the dotted line, you have an opportunity to build a great experience. Don’t equate the two as the same. Customer service occurs when your client asks you for something. The measurement of success should be timeliness and accuracy in the response. It’s the proactive set of activities and behaviors that you’ll provide that adds value in the relationship that has nothing to do with the product. Look at every touch point to find every opportunity to do something different that your client will find meaningful. Your true competition exists in your battle to earn face time with your prospects. No executive has the responsibility to meet with salespeople every hour on the hour. In order for us to earn that meeting, we have to create intrigue in the first moment. Imagine operating the way the police do. When they knock on your door to ask questions about a crime, they don’t randomly choose your home for a conversation. They follow a trail of evidence that leads them to you. They’ve put together a theory, and you should do the same with your sales efforts. 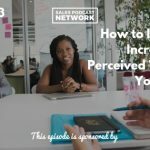 Instead of blindly calling people and sending emails, put together a sales crime theory, based on the answer to this question: why should they want to have a conversation with us right now? Instead of asking why we should talk with them, ask why they should want to have a conversation with us. Put together a messaging strategy based on your research that will help them recognize what you have to offer. Lee’s book Sales Differentiation:19 Powerful Strategies to Win More Deals at the Prices You Want is available in bookstore, at your favorite online book sources, at Amazon, and a variety of other places. You can also go to salesdifferentiation.com and register for Lee’s video series. The videos are typically only available to workshop clients but he’s making them available to the people who purchase the book. Go to the website, click on “bonus,” fill out the form, and start taking advantage of the videos.